After our slight change of plans for heading north, my dad rearranged his plans to spend a week of forced R&R on the boat instead of 3 weeks bashing north. Though Jason and I were both utterly stoked about the decision to cheat Neptune, my dad was slightly disappointed not to do the delivery. Yes, he's nuts. "Boy Christy, this looks a little flat - couldn't we order up some 18 foot seas and 25 knot head winds to bash into?" 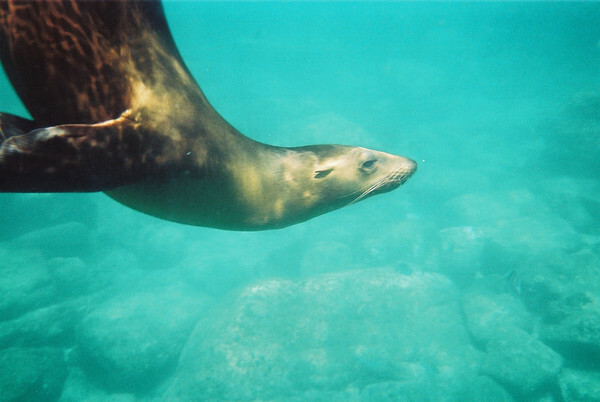 We did, however, have a great time for the week he was here, hitting many of our favorite island anchorages around La Paz. We caught more fish in 1 week than we did all winter. 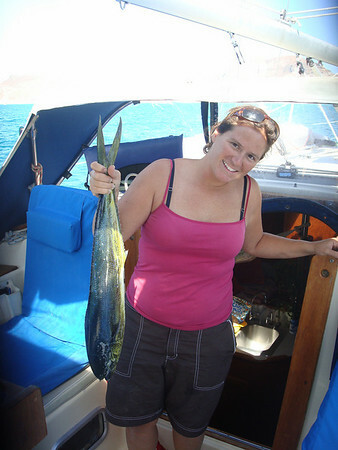 A tasty dorado outside of Balandra, a nice-sized Sierra on our way north, and a dolphin. Yeah, really. A dolphin. 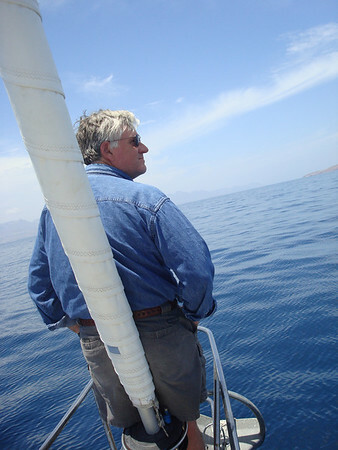 We were sailing northbound with a handline out and the wind was slowly dying. We were making about 2 knots and talking about maybe taking the sails in so we could anchor before July, when we noticed a pod of dolphins behind us. And then we saw 2 of them right behind us - about 40 or 50 ft. The lure on our handline would have been slowly drifting down and I decided to pull it in - the last thing I wanted was a dolphin hooking on. But those dolphins, they're fast. Faster than I can pull in a handline, and next thing I knew, something BIG hit the line. It took a few seconds before the line broke and then a dolphin FLEW out of the water, straight up about 8 or 10 feet into the air not too far from the boat. This happened 5 or 6 times every minute or so. Certainly, I'm only speculating that 1) a dolphin either bit or snagged our lure and 2) that same dolphin went a little crazy since he was hurt. 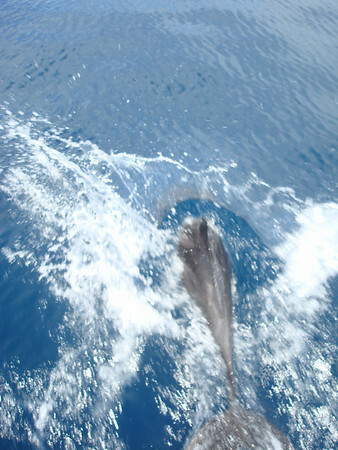 But we've seen hundreds of dolphins in the sea and have never seen one do what this one was doing. Of course we felt awful, but couldn't really do anything for him. We're just hoping our wild animal karma is back to even after helping out the whale. 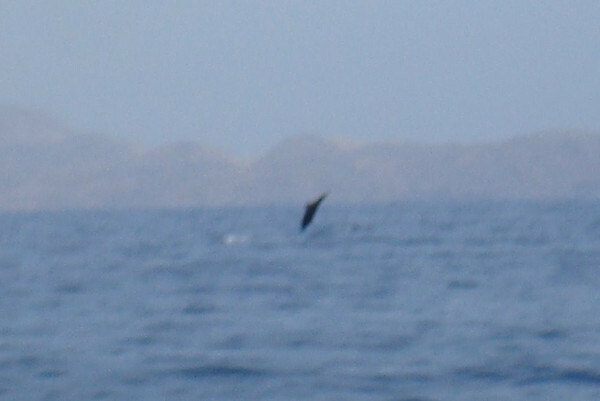 Sorry about the fuzzy pic, but this is the best shot I got of the dolphin going crazy. In addition to our record-breaking fish catching, we also had record breaking sailing the week Pa was here. Great wind all week, it was most fabulous. We are too tempted lately to motor whenever wind conditions aren't optimal because motoring = running the fridge = cold beer. 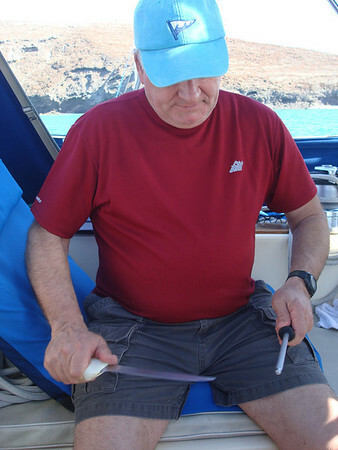 Fortunately, since we had just come from La Paz and filled up on ice, we had sailing AND cold beer. An uncommon combination. 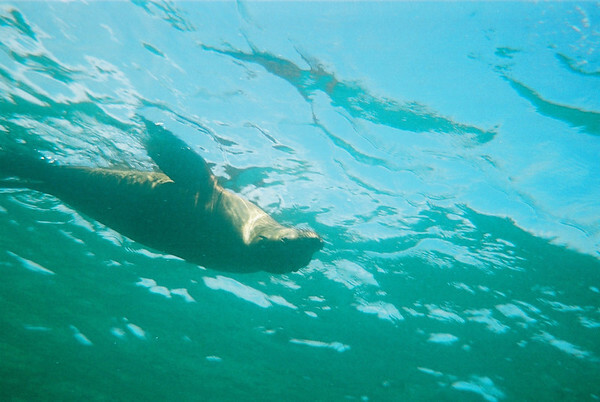 We also did quite a bit of snorkeling in the different anchorages we hit, and had a perfect day to see the sea lions. But this time, we got pictures!!! They seem to love imitating people, and seeing if people can imitate them. My parents have this thing with bringing knives out in front of my boyfriends. The first time my dad met Jason, he had a machete on him. Dad was very disappointed by (a) the quality of my knives (Ikea) and (b) how sharp they were, so we got a lesson in sharpening. 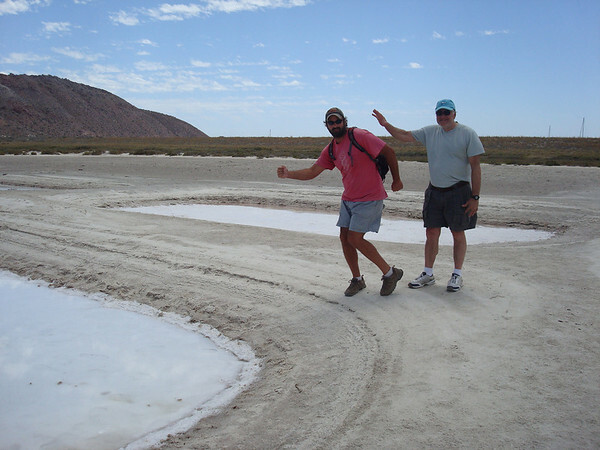 Goofballs at the salt pond. 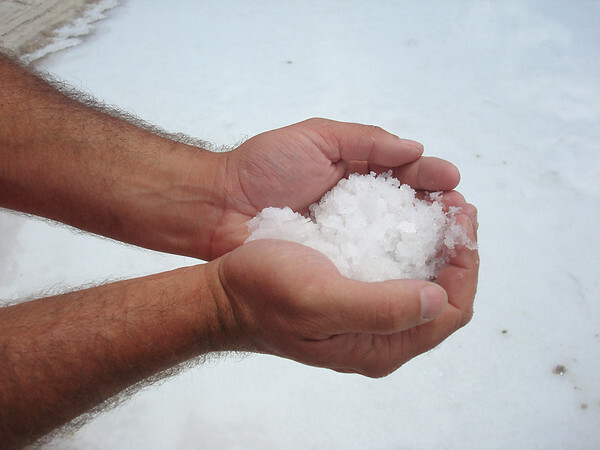 We collected a serious amount of sea salt. Ohhhh margaritas here we come!